Our philosophy at The Wealth Strategies Group is based on the premise that all areas of one’s financial life have complex relationships with each other. As independent financial advisors we do not offer proprietary products, therefore we are able to provide our clients truly objective advice. Our strategies involve careful tax planning, disciplined investment strategies and thorough estate planning. Our goal is to understand each of our clients’ unique circumstances and to then enhance their success with the use of proper tax planning, asset structure and asset management. Through our custom designed thinking process we educate our clients on the tools, techniques and systems that provide each member of their family with direction, capability and confidence. 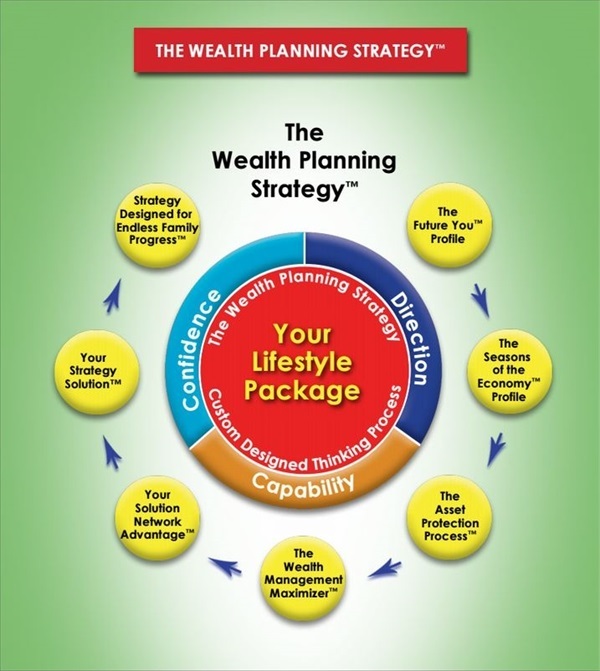 The Wealth Planning Strategy™ is an alternative to traditional financial planning. This is a customized thinking process that will organize your financial life to create confidence for each member of your family. This future based discussion creates the goals we will build toward. We will identify your dangers, opportunities and strengths (while we build toward your financial future). If you don’t understand what causes an investment to go up you won’t understand when it finally comes down! A farmer knows his crops will not grow if they are planted in the winter. We help you determine what season the economy is in before you plant or harvest your investment. What difference does it make how much you earn or accumulate if you forfeit all, or a large percentage, of your asset base to frivolous lawsuits or unnecessary Federal Estate Taxes (FET)? The detail from your “Future You Profile” is used to prepare a structure for asset protection and estate transfer. Over twenty-five years of investment management wisdom and understanding are combined with your “Current You” and “Future You Profile”. The result is a customized investment strategy that overlays your constraints for time, risk and volatility. Successful people understand that in a complex world you must surround yourself with experts in various fields. This team of Strategic Partners includes CPA’s, Estate Planning Attorneys, Mortgage Advisors, Insurance Experts and an Independent Automobile Broker. This in-depth review is your customized Wealth Strategies roadmap. Your life events are timelined over the seasons of the economy. Your assets structure detailed, your investment processes are outlined and your tax considerations are overviewed. Liability protection structures are outlined as are estate transfer issues. This holistic, comprehensive approach provides you with confidence in your future. It is only possible to progress when you know where you are going. With your Wealth Strategies Solution complete we now focus on your progress. This annual strategy meeting evaluates your progress, reviews your structure and repositions resources and assets to account for the new goals and objectives.